Do we know the differences are due to 'training'? Off the top of my head, I wouldn't be surprised if people who were already math whizzes went into physics and maths, and verbal whizzes went into philosophy. Given 'applied' degrees like business and accounting are less prestigious, the candidates tend not to be so bright. The point is if you like something you do a lot of it, and if you do a lot of it you become good at it. It's the same with everything from cricket to maths. It's natural to be attracted to the things that you're good at, because you enjoy doing them and you become better at the doing. Writing is what I do best but when I was at school (and uni) I couldn't write an essay to save my life. I didn't know I was good at it until someone pointed out that I wrote a good business letter (when I was working as an engineer). The thing about Philosophy is that it deals explicitly with the processes which are used (implicitly) in all other subjects - reasoning, argumentation, understanding and forming concepts, making ideas clear. It can be very abstract (in fact, in many ways similar to higher maths) which is I suppose one reason it gets the "useless" label. When I was considering what to do at Uni, I considered philosophy; I read a few books and found it fascinating, but at the time I didn't realise it wasn't just about the flow of ideas (which is what appealed to me), but about structure, consistency, and logic. Nor was I aware that it wasn't merely about reading and analysing the works of the great philosphers, but requires actively DOING philosophy yourself - again there's an analogy with maths in that it involves problem solving. Everyone advised me to do something more "practical", so I ended up doing engineering instead. I don't regret it, but it's a pity I hadn't learned more about what philosophy really is at school. These days I believe it's available as an A-level subject. This is the new Pascal's wager, and much like the old one, I don't think its a dignified game to be playing. If you're picking your major like Pascal proposed one should choose whether to believe in God or not - in terms of what value you can win by betting best - you're doing it wrong, and He will not approve. A philosophy degree is not valuable because it makes you a better hire than an accountant. Its valuable because the unexamined life is not worth living. 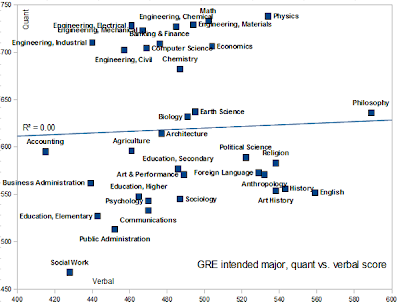 I don't think I should be defending my degree in terms of its instrumental value - the study of ideas is valuable even if what I learn is uniquely unsuitable to helping me get a job or pass a standardised test. The happiest philosophy graduate I know is a bus driver. He has hours and hours and hours to think every day. Fascinating. I notice Medicine isn't on the chart - no data available? As if writing and verbal are not in the same category. 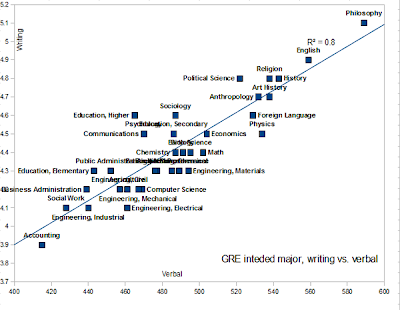 What the graph only shows is that those who are good in quantitative are those students who are intending to major in areas that will do a lot of mathematics. 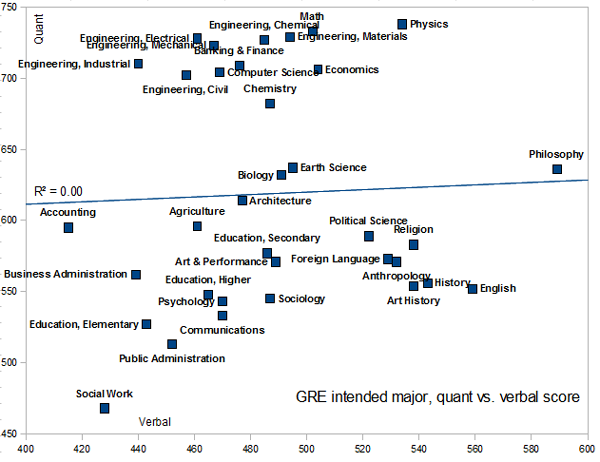 And those that are good in language are those that choose to major in areas which require a lot of reading and writing. Given enough orientation/training those that are good in mathematics can develop to become good analytical communicators too. I doubt that Philosophy majors will excel in Maths if given the training. 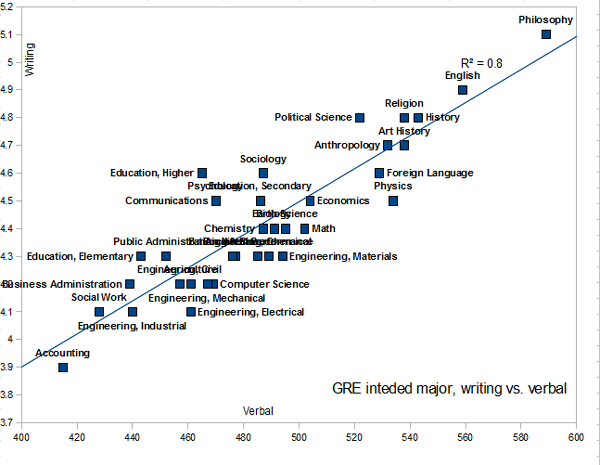 You say that Philosophy majors are one of the smartest, let's look at the result of their IQ tests. "Of course, as the new business-friendly, market-led Tory vision of degree provision kicks in, we'll probably see philosophy departments up and down the country closing and business administration degrees expanding. Brilliant"
From the other side of the political spectrum it seems clear evidence that business studies et al are under performing and so should be given more funds. "You say that Philosophy majors are one of the smartest, let's look at the result of their IQ tests."